Judy Winter is an award wining journalist on special needs parenting issues, and recipient of the 2002 Exceptional Parent Award. Ms Winter has had extensive experience on TV, radio, in print media, and maintains a rigorous schedule of speaking, workshops, conferences, and ongoing public appearances on the subject. Her work, in articles either about or by her, has appeared in People, Child, Writer's Digest, the Toys 'R' Us newsletter, and she has worked for PBS in Michigan for eight years. Her first son Eric had cerebral palsy and died at 12. She and her husband have one daughter, Jenna, and live in Michigan. This is the only special needs book I’ve ever read completely in one sitting. I literally couldn’t put it down! Judy Winter’s refreshing style – at once both loving and no-nonsense – makes you feel like you're with a friend you've known for years.…I love practical, and this book is packed full of tips and information you can USE." "Winter combines her talents for journalism and parenting in a book that is part inspiration, part how-to, and wholly optimistic about your family's survival as you take on the challenge of raising a child with special needs." 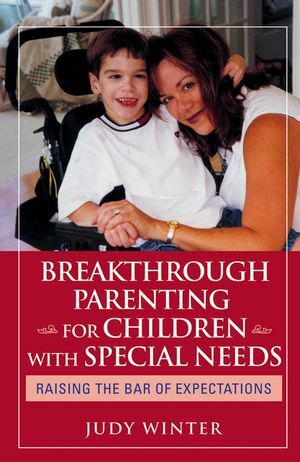 "In Breakthrough Parenting for Children with Special Needs (out last month from Jossey Bass), award-winning writer Judy Winter helps parents 'raise the bar of expectations' for their challenged children. Winter fought for a normal life for her son, Eric, before losing him to cerebral palsy. "The demands of special needs challenged me to the limits of human endurance and helped me realize my most heartfelt life dreams, too," she writes. From getting over the myth of the perfect baby, to dealing with staring, to maneuvering the school system, her wisdom is both practical and inspiring."